The "basis" are the blind items from E Online gossipist Ted Casablanca. There are blind items about a young, closeted Hollywood actor who has a secret boyfriend, who is also an actor, but by far not as talented and successful as the other. Some or even many believe the closeted actor is Jake and that his friend and co-star from TDAT is his secret boyfriend. Ted C. also keeps insinuating that the closeted actor is Jake. I personally think Ted C. heavily exaggerated or even made up the items, but still some people believe them. It's probably because they are sitting so close they are touching. Most straight men won't do that. I mean that is what i've experienced. Most straight men i've known won't hug each other. They give that hand shake, back slap combo. LOL! It could be a regional difference or it could be a social difference. I think it's probably also an age thing as well to a certain degree. Men in the older generations generally are a lot more reserved in their friendships (at least here in the UK anyhow) whereas younger men tend to be a lot more demonstrative, some anyhow. I have a friends lock on my lj and so I have quite an extensive friends list and I sometimes scroll through my friends page. It amazes me how vicious people can be in this matter. The posts I have seen on there that reflect so much hatred towards Jake just continue to baffle me. Didn't he give us as much a gift by giving us Jack as Heath gave us giving us Ennis? Personally, I feel disappointed that Jake hasn't said anything, but I don't think he's worth less than before this all happened. For a lot of people it's hard to contemplate that the two of them probably weren't best friends or friends at all. I also believe that they weren't that close anymore, as they moved in different circles. I agree with Louise that a lot of people who read RPS and are unable/ unwilling to distinguish fact from fiction, are so devoted to the idea of them together, it's almost scary. It's the discussion that ran out of hand a while back in which we asked if people should still be reading and writing RPS after Heath's death. I have never read or written RPS and it continues to amaze me that it's so popular. The basis? A very cute picture of Jake and Austin together at a basketball game. From one picture, a romance was born. I know, that's so ridiculous! Bliss, it's like that in the U.S too. It's crazy that people see a picture and start a rumor off just that. By the way, the look on Jake's face in that 3rd one is so adorable! 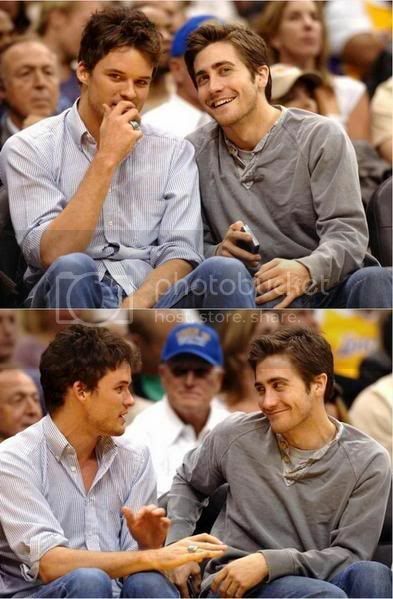 By the way, the look on Jake's face in that 3rd one is so adorable! Agreed, but i think Austin Nichols is cute too. Jake is still trying to get over Heath's passing. So am I. He doesn't have to say anything about it if he doesn't want to. God, I wish people would just leave Jake alone. Because these days, the monstrous media and others are picking on him and insulting him. Everytime that happens, I feel so sad that I have so much sympathy for him than anyone else. He's dealing with the stupid public eye that are trashing him and trying to make him out as a clown. It makes me angry that they do that! He's dealing with no longer being able to see, talk, and laugh with his best friend in the world for Christ's sake! I know don't you just want to slice him up and eat him like cake!? !